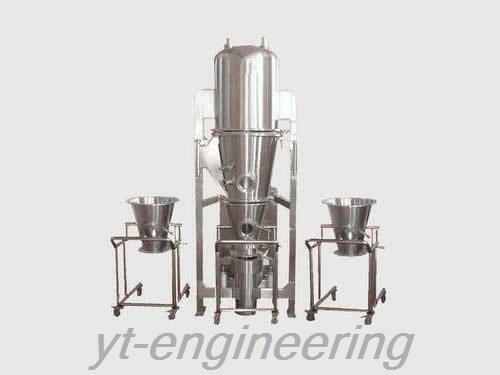 1.Fluid bed coating machine is ideally suitable for capsules, pills, granules and powder coating. 2.Fluidized bed coating equipment mainly serves to improve the general handling or storage times, i.e. time limited protection against moisture, oxygen or light. 1.The production cost of fluid bed coating machine is low without any coating material losing. 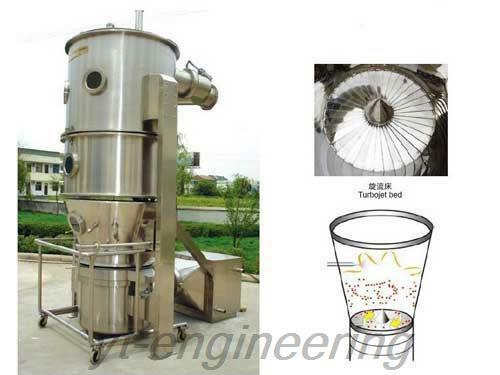 2.The material dispersion of fluidized bed coating machine is excellent and there is no adhesion phenomena. 3.The line between fog particles and materials is short without any spray drying phenomena. 4.The products of fluidized bed coating equipment are capable of moisture-proof, anti-oxidation, water-proof and exothermal coating. 5.The bottom spray is fluidized and there is strict running truck for the materials and therefore uniform and continuous coat film can be produced. Feeding Amount (g/batch) 3 5 10-20 25-40 40-80 50-90 80-120 150-200 According to user requirements. Founded in August, 2000, Jiangsu Yutong Drying Engineering Co.,Ltd. is a professional fluid bed coating machine manufacturer and granulating machine supplier in China. Yutong possesses 10 professional engineering and technical personnel and over 100 sets of processing equipment. Over the years, we make our effort to the development and production of fluidized bed coating machine, drying equipment, grinding machine and blending machine. With rapid development, we have already accumulated abundant capital and technology strength. 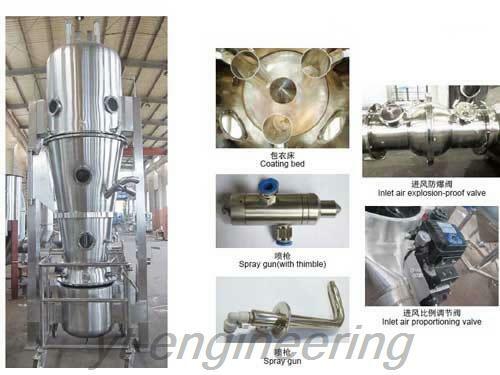 Yutong has various experimental coating machines for customers to test and inspect.